Cream butter; add sugar and beat until fluffy. Add egg and egg yolks, one at a time, beating well. Beat in vanilla and lemon rind. Sift together cornstarch, flour, baking powder and salt. Add to mixture and mix well. Drop batter by small spoonfuls onto well buttered baking sheet. Bake at 350 degrees for 15 minutes. Remove immediately. Easy version: use 1-2 boxes of vanilla wafers. Sandwich the cookies together with dulce de leche (caramelized sweetened condensed milk). Roll edges in coconut. Dip entire cookie in melted chocolate. Let dry on wax paper. Store in air-tight container. Best if made the day ahead. If using vanilla wafers, make a day ahead and leave uncovered to allow the wafers to get soft. crushed red pepperFinely dice the beef. In a medium-size frying pan, melt 2 tbsp vegetable shortening. Dice the onion, bell pepper and add to the pan. Saute over medium heat until the onion starts to turn golden. Add the diced meat. Season to taste with salt, red pepper, and paprika. Saute, stirring occasionally, until the beef turns brown on all sides. Remove the frying pan from the heat. Mix in the egg, the raisins, the olives, and the green onions. Allow to cool until it drops to room temperature. Preheat oven to 450 degrees. Lightly flour a baking sheet. Arrange the empanadas on the sheet and until the pastry is golden brown, approx. 10 minutes. Mayonnaise and Salt to taste.Cook potatoes and carrots separately in boiling water until tender. Allow to cool and cut into cubes. Add peas, mayonnaise and salt to taste. Mix well and refrigerate. Serve cold. This is a dessert that can be eaten with a cup of coffee in the afternoons, as a snack at any time of the day, late at night, etc. Of Italian origin, this can be done with the filling you choose, it’s usually done with quince paste, or dulce de leche or tomato jam, either way Pasta Frola is delicious, and Argentineans love it. With dulce de leche it is a great dessert! Put in a bowl the flour, the sugar, baking powder, salt and butter. With your hands work this so that the butter looks like corn grains. Then add the eggs, the water and the vanilla. Separate ¼ of that dough. With the ¾ of the dough, cover a baking dish that has been previously buttered. Once the dough is all covering the dish, fill it with the filling you choose, be it quince jam, dulce de leche or tomato jam. With the ¼ of the dough you had separated, make long strips and cover the whole dish from one side to the other in a crossing pattern, covering partly the jam. 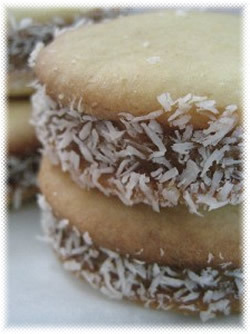 You can put grated coconut in the borders of the cake, where the strips join the other part of the dough. Take it to medium warm oven, for some 25 minutes. Serve it cold, delicious with a cup of coffee.